Who needs pie when you can have Apple Cheddar Biscuit Cobbler instead! Who needs plain old apple pie when you can lip-smack with this Apple Cheddar Biscuit Cobbler instead? So which is it…. Grunt? or Slump? You might have seen these descriptions for fruity desserts and wondered…what the heck? Well you will be happy to know that grunts and slumps are one in the same! Now don’t confuse them with cobblers, crumbles and crisps, buckles, brown bettys, pandowdy or the regionally almost-famous North Carolina Sonker! Are you fully befuddled now? Each one of these baked goods are delicious in their own way, but are not the same… and traditionally include fruit, flour, sugar and butter. What can be wrong about any such thing? So, let’s have a quick lesson to un-confuse ya. Let’s start out with the grunt, aka slump, since this post’s recipe is just that! Featured in June’s Carolina Country Magazine, you will find my Campfire Fruit Grunt recipe down below you can easily print out and make for your crowd this July 4th! 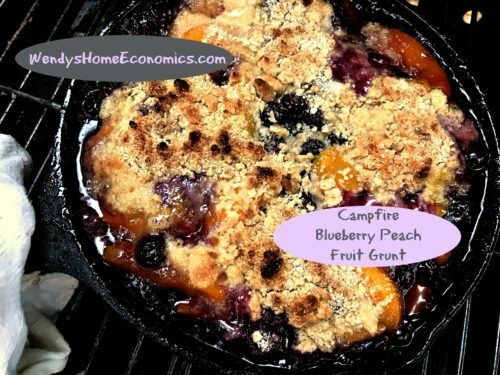 Originally an English steamed fruit dessert, a grunt/slump is basically a cobbler, but cooked covered on a campfire or grill… or stovetop, rather than inside the oven. This kinda sorta steams the topping (typically a biscuit type dough)… and when it cooks, it makes a “grunting” noise around the edge and topping… thus, the name “grunt.” And once done, it “slumps” down into the skillet…. voila, “Slump!” I’m particularly fond of crispy crunchy things, so you will find the topping on my grunt/slump recipe below to have a bit of those features rather than a softer biscuit dough as you will find with traditional recipes. Cobbler… the name comes from the “cobblestone” appearance of the baked topping of a cobbler. Traditional cobblers are cooked casserole style and topped with biscuit dough and once cooked resemble cobblestones you may see on an old street…. not pie crust as many folks do these days. If you are served cobbler with pie crust on top, that’s pie, not cobbler! Sometimes you might even see a “crust” bottomed cobbler too. The filling cooks down into a fruity syrupy goodness. Nowadays you might see cobblers topped with such things as cookie dough and even cake batter. Crumbles and Crisps... as the name says, this crumbly-topped fruity baked goodie is topped with an oatmeal struesel mixture…. thus, you have a “crumbly” topping. Nowadays these have become one and the same. Originally, the main difference was that crisp toppings had oats while crumbs did not. Other toppings might have nuts, graham crackers or cookies in the mixture. Buckles… these are kind of a cake with fruit on top of the batter and a crumb topping. They are kinda sorta like a coffeecake, but have a softer and more buttery texture. And of course the name…. because it buckles when cooked! Brown Bettys…. from Colonial days, this dessert usually features layers of sugared apple slices and buttery crumbs, most often made from stale bread. Our ancestors wasted nothing and of course, would turn old bread into a sweet treat! Pandowdy… this is basically a pie without a bottom crust. Pieces of crust dough are scattered about the top and as ready to serve, broken up into the fruit with a spoon a bit and “dowdied” up so to speak. Traditionally made with apples, pandowdy can be made with any sort of fruit. Molasses is sometimes used as sweetener in Pandowdy, or Pan Dowdy, spelled both ways. I could go on and on about the sonker and will one day do a post just on that topic. For now, you can read more about its history at Our State Magazine. There are other similar fruit desserts, but will save those for another time… like Clafouti, Shortcakes, Boy Bait, Long Cakes, Bird’s Nest Pudding and some I may not even have heard of. Today’s post will get you started…. so throw yourself together this Grunt/Slump I recently created for Carolina Country’s June edition. I declare, here in mid-blueberry/peach season in North Carolina with folks camping and grilling all around, there’s no reason not to! So stop by your local peach and berry farms or farmers’ market and get some fresh summer fruits… your favorites, and GRUNT! Grunts (also called Slumps) were born in New England and are a steamed cobbler that “grunt” when cooking and “slump” as they settle. This treat will make you the envy of the campground! Great as a dessert, but also enjoyed as a breakfast treat as well. Prepare coals or heat grill to medium high heat. Put fruits, sugar and cornstarch in skillet and stir to combine. Put all dumpling ingredients except milk into zippered plastic bag. Squish with fingers until butter has been incorporated and you have a crumble mix. Blend in milk. Add dollops of dumpling batter on top of fruit, leaving space for it to bubble and “grunt.” Close grill lid to cook. If cooking on open coals, cover with foil. Cook over indirect heat for about 15 minutes until hot and bubbly. I'm so glad you dropped by. Come along for all sorts of adventures, in AND out of the kitchen. You just never know where we may take a field trip to next, so stay tuned, class is about to commence. Now you know better than to think I'll send you any junk from my classroom, and would never share your email either. So go ahead and subscribe before the class bell rings... don't be tardy! ...join my Table Scraps newsletter list! Winter Citrus Salad… with blood orange & red wine vinaigrette ~ Sunshine! Sometimes you win… sometimes you lose! This time, I have a winner~ with Aunt Nellie’s! Let’s Collaborate on Recipe Creation & Testing! Do you need food and prop styling? Photography? Pen to Paper… I love to write!